Anno 1800 nails its gameplay loop with aplomb while adding plenty of new features to expand it further. From the grand aesthetic to the rich atmosphere and gameplay depth, Blue Byte's latest is a return to form for the franchise. 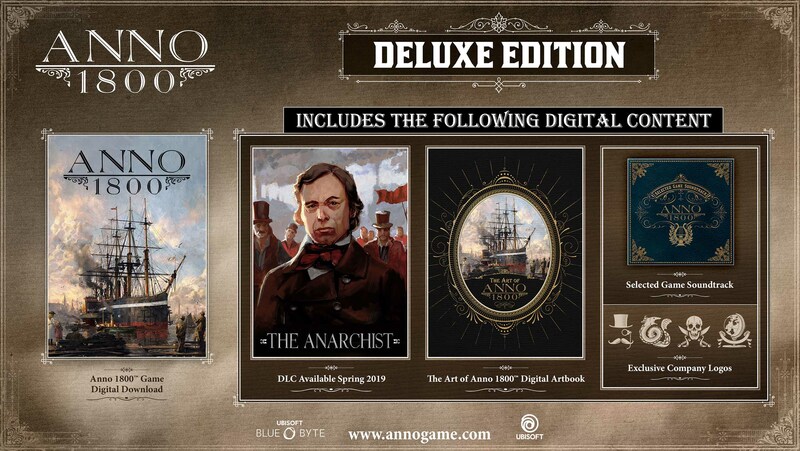 As seventh entry in the series, Anno 1800 plays to all the strength of its predecessors and adds even more content. Some of those additions may be a little off, but in overall this may be the strongest classic Anno title yet. Anno 1800 might be the best 4X game since Civ 6 and definitely has brought back the series' glory. Anno 1800 successfully delivers a fantastic city management game worthy of the dozens of hours you will most likely put into it. A gorgeous-looking, extremely polished city builder that offers a relaxed experience with light RPG, diplomatic and combat elements. Anno 1800 brings back the serie to the roots and it is one of the best episodes. The foundations of Anno 1800 are solid, and the game offers a diversified experience. Going back to the roots was a crucial decision, and I can say, with all certainty: this is one of the best strategy games of 2019. It’s been a long while since we had such a lovely and absorbing game to play. Will satisfy your strategy game hunger. These are almost similar to Anno 1404. Series is back to it's roots! From the annoyingly little time I could spare with the open beta, all I could conclude is that the tutorial is surprisingly a little weak (I managed to complicate things to a certain degree by not putting my farms where the game wanted me to) and that it is indeed, very good looking and charming. As a relative newcomer to the series, the system seems more demanding than Tropico for example, I could see the flow of production becoming a little to much on the headache inducing side for my tastes. But I would most certainly like to play the final game if this month wasn’t such a hellish money desert. The game looks solid. Seeing the potential of the game, I’m even curious toward the next Settlers, a series I had nearly forgotten for so long. It wouldn't be an ubi game if it didn't have more layers of security than government computers have. Enrich your city-building experience with the Anno 1800 Season Pass. The Season Pass contains 3 DLCs that will give you access to new adventures, challenges and tools as you shape your very own Industrial Revolution. I played a good chunk of this last night, really like it. Its very similar to 1404. I like how wheat fields are single square that you can link together to make realistic looking crops. Lol, I currently have two SSDs and an old HDD full of installed games, i never delete anything just in case i want to fire it up one day. Hopefully they patch out that nasty Steam performance bug soon. I tried the open beta which sold me on the game, and it is demanding enough as is. Playing more and more of this game and now I'm starting to understand the systems. Restarted the game and now my island is nice looking and I believe I can maintain functionality over time. I'm really digging it. I appreciate that Anno's systems are simply less sadistic than something like Sim City while not just being a sandbox builder like Planet Coaster or Cities Skylines. Just good gameplay balance.